— Cable’s message to the fans and media is the Raiders are still operating as if they’re in the playoff race, so much so that no extra motivation need be found anywhere. No need to worry about the Raiders being overconfident after laying a 59-14 beating on Denver on Oct. 24. Or about the Broncos raising up and playing spoiler. “We have been so focused about this opportunity that we have, and we feel like it slipped away from us on Sunday,’’ Cable said. “It’s over, we have to move beyond it and so it hasn’t been about those kinds of things. — No public diagnosis yet on the left foot of Rolando McClain, an issue which kept him out of practice Wednesday. Also missing practice were wide receiver Johnnie Lee Higgins (ankle), cornerback Nnamdi Asomugha (ankle) and defensive tackle Richard Seymour (knee). Those were limited were wide receiver/return specialist Nick Miller (ankle), tackle Khalif Barnes (lower back) and quarterback Kyle Boller (quad). Tight end Zach Miller (foot, leg) and cornerback Chris Johnson (groin) were listed as having participated fully. Asomugha and Seymour’s conditions are not expected to threaten their availability against Denver. If Higgins can’t play, Nick Miller would return punts. Quarterback Jason Campbell, who has had three stingers this season, including one in each of the last two games, was asked not to address the condition before his media session but not listed on the injury report. — Although the Broncos were strictly a passing team when they last met the Raiders, they’ve attempted to run the ball more under interim coach Eric Studesville, featuring second-year back Knowshon Moreno. Although Studesville has named Kyle Orton the starter, the rookie Tim Tebow is expected to play _ it’s just a question of how much. “We’re preparing and are up to speed on that,’’ said Cable, noting the Raiders use a running back on the scout team to simulate formations with Tebow. — Cable made it a point to make a request for fan support over the last two weeks. — Asked specifically about the five safety formation that was victimized against Jacksonville for a 48-yard touchdown pass from David Garrard to Jason Hill, Cable was asked if using Stanford Routt or Chris Johnson (assuming Asomugha was out to rest his ankle) wouldn’t have been a better option than going with all safeties. I like this blog, too. I agree with most. I could just see some truth and appreciate what the guy was saying is all. I don’t agree, but I find it funny that 90% of the time it is directed at you. That’s the #1 line on this board. I think my posts smacking down multiple challengers just stick out in your mind, lol. Especially when I go to the film on them right after that ridiculous jive. And since I took that the wrong way, LOL. Most people in Raider nation don’t stoop to A’s nation. The writers on this site like to start crap with the team sometimes. I can’t stand that. And I get, do you watch the game? I think Campbell was throwing the ball to the sidelines on the last play this past weekend and I get, do you watch the game? Do you watch the games usually = I’ve ran out of material on whatever point I was trying to make. You know, you’re basic filler. I hate that whole I’m a bigger fan than you BS. Just like the right-wing tea partiers love their country more than the other side. Just plain ridiculous, IMO. The Raiders are/were on a historically bad run, and if you still are here blogging about the team throughout the day, your “fandom” should hardly be questioned. Cincy can go Fock themselves! (FreshlyWaxedBush) Thats what Im saying but who knows it seems like every year something crazy happens with us. The fact that we can even discuss the possibility of playoffs is a testament to this team. Even so, with the schedule we had this season, we should have had 10 wins. Now, with 7 losses, I consider this season a disappointment to say the least. I, like the coaches, was wrong about Grad’s ability to win games with fire and courage. This mistake is likely the #1 reason our season has not been as successful as we had hoped. Still, we have a reason to continue to fight hard, and I hope we do so with passion and determination. The future still looks bright, but the Denver Broncos would like nothing more than to wound us now, and return us to the bottom of this division. They do not want to take over as “laughing-stock” of the league, and they know they are dangerously close. They are going to try and come into our house and humiliate us. For the sake of the psyches of our young talented players, we cannot let that happen. Confidence is Key. We need to dictate this game on both sides of the ball for all four quarters. Our special teams needs to step up and our kickers need to play to their potential. It could be a rainy, sloppy, game – but we need to overcome those obstacles in our own stadium. Our run defense needs to on its game, as this this may be a slop-fest. 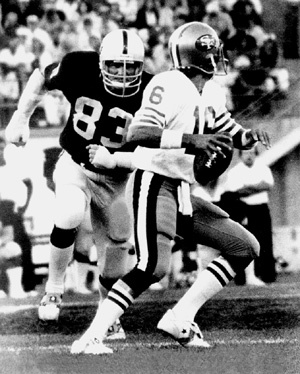 I want to see big John Henderson have his best game as a Raider. I hope Huff and Branch are working on their Tackling as we speak. I want to see McClain in there laying the wood like he did against SD. We are gonna need him in there keeping an eye on Tebow – who, make no mistake, is a load to bring down. I want to see Nnamdi out there healthy, and expose the rookie QB with a pick. I want to see DMAC and BUSH pound the rock ALL DAY LONG! I want to see the Campbell Scramble! The deep balls to our wide-outs will be tough in the rain. Use those check-downs, dump-offs, and screens. Get the ball to Murph, Ford, and DHB with the short-pass, lets see what the speedsters can do with it after the catch! Basically, lets be fresh, focused, and on our game. Let the elements help us, not hurt us. Lets play smart football, and lets remind Denver why they are in the basement! A reason why Cable wont be HC next season is simply because Hue Jackson has done what he was asked to do—improve the offense. It’s been lights out this year. Given how many years other OC’s have struggled to do anything of merit, Jackson has immediately. Ie, we’re gonna have to promote Jackson to HC otherwise he’ll get snapped up by another NFL team like Cincinnati. Hope it doesn’t happen…otherwise it might mean back to square one with a new offensive coordinator. I don’t see Cinncy hiring Hue though. It seems it would be a reach for them. Huff might make it as an alternate. It has easily been his best year this year!